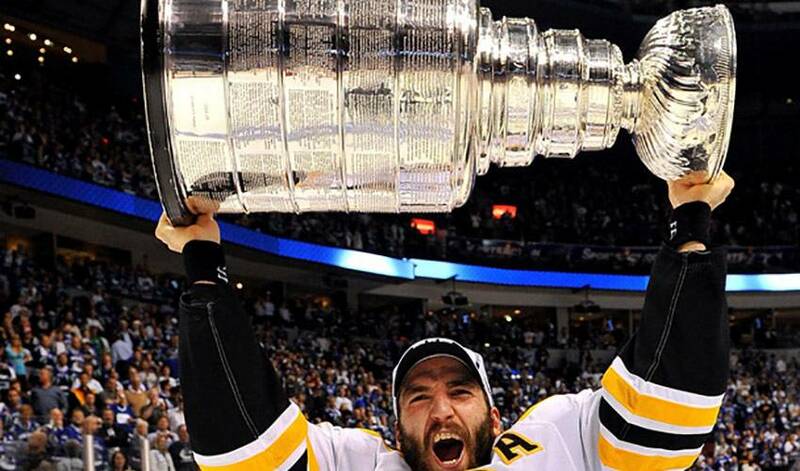 Patrice Bergeron couldn't have scripted a better ending to Boston's championship season. In fact, you can say his performance was as good as gold. His first period goal on Wednesday evening in Vancouver set the tone for the Bruins in Game Seven of the Stanley Cup final against the Canucks, a marker that ultimately stood as the game-winning tally in an eventual 4-0 Boston victory, delivering the franchise its' sixth championship. The evening proved to be twice as nice for Bergeron, who netted his second goal of the night (a brilliant short-handed effort) and third for Boston, as the Bruins celebrated their first Cup triumph since 1972. With the win, Bergeron became the latest entrant into the Triple Gold Club, a term used to describe players and coaches who have won an Olympic Games gold medal, a World Championship gold medal, and the Stanley Cup. As for his significant early contribution, a quick shot that hit off the post and in, Bergeron might still be unsure if the pass in front of the Canucks net was intended for him. But he wasn't about to waste a high-percentage opportunity. The soft-spoken centreman wasn't talking big when he reflected on the impact of what he had done. “That first goal was huge,” he noted. Bergeron himself was huge throughout the 2010-11 Playoffs, recording 20 points in 23 games, while providing the Bruins with stout defensive work. And while he was calm and collected on the ice in the seventh and deciding game, he admitted to battling nerves before the puck dropped, turning to a veteran teammate for guidance and support. Bergeron has made his own impact on the game, too. He played his junior hockey with the Acadie-Bathurst Titan of the Quebec Major Junior Hockey League (QMJHL) for one full season before he was selected 45th overall by the Bruins in the 2003 NHL Entry Draft. Bergeron joined the Bruins in 2003–04. In his rookie season, he was chosen to play in the NHL YoungStars Game in Minnesota as part of the 2004 All-Star weekend. He finished his rookie season with 39 points in 71 games. Almost 500 regular season games into his big-league career, Bergeron, who has battled serious injuries over his time in the NHL, is one of the sport's most resilient and respected citizens. And now, he has a coveted Stanley Cup to go along with gold medals at the 2004 World Championships, 2005 World Junior Championships and 2010 Winter Olympics in Vancouver. One he and his teammates were glad to deliver to a supportive group of fans. Which is precisely what Bergeron can say about his top-notch performance in the contest that gave him his first Stanley Cup ring, including the goal on the scoresheet that has game-winner marked beside it. “Well, post and in, you can't ask for anything better, can you?” he said. Maybe another Cup victory, but that can wait until next season. For now, Bergeron and his teammates will savour a hard-fought victory for as long as they can.